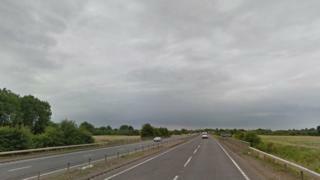 A biker has been clocked speeding at 100mph (161km/h) with his 10-year-old daughter on the back, police have said. He was stopped on the A47 at Terrington St John, Norfolk, on Monday night. Police tweeted they were "shocked" by the man's speed and that his young daughter was riding pillion on the motorbike. Sgt Chris Harris, from Norfolk and Suffolk roads and armed policing team, described it as "unbelievable and entirely irresponsible". It is not yet known what action the rider faces.